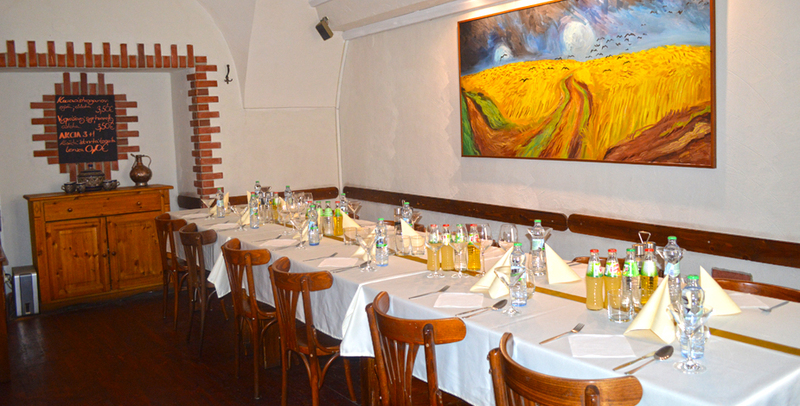 The restaurant is located in the golden cross the city of Kosice, 30 m from the greatest landmarks of Kosice, St. Martin’s Cathedral. Elizabeth at the entrance to the restaurant that bears elements of impressionism to impress you by its unique and exceptional environment in the style of Van Gogh. We offer a wide and attractive range of delicious meals right for you with friendly service. There is an atmosphere that encourages conversation and comfort but also fun and relaxation. The possibility of renting the lounge for various family celebrations, anniversaries, christenings, graduations and other social events. We offer a special menu (appetizer, soup, main course, dessert) from 11 € / person with full decoration. Rent lounge is free, after agreement is possible to own alcohol. Lounge has a capacity of 30 seats. Meals are made of professional quality ingredients and a flair for your taste buds. On weekdays we offer a selection of five kinds of meals and two soups. Over the weekend, we offer three meals and two soups. Enjoy your meal.